It's that time of year again  the time when we contemplate the discarded remains of our Thanksgiving feasts and Black Friday shopping excesses and swear that, come this time next month, those sorts of things will never happen again. On January 1st, we will magically become the disciplined, productive, non-turkey-binging people we have somehow failed to be in 2010. If you're one of those rare people who make resolutions year after year and keep them, that's awesome. I sincerely admire you. I'm writing this post for the rest of us. I think goals are important, but there's something insidious about New Year's resolutions, especially when we make the same ones over and over, only to fall short a few weeks (or days) later. I think that's the core of the problem  resolutions are just a way to put something difficult off another month. Sure, the holidays are tough  schedules are chaotic, family is in town, we're out of town, the food is so tempting, etc. 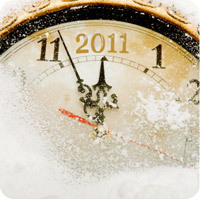 Realistically, though, will we magically be different come January 1st, 2011? Will we suddenly be blessed on midnight of December 31st with the resolve we've lacked? I think this brilliant article on procrastination sums it up well. Resolutions put all of our faith in our future selves. "Future you" will somehow be able to do everything that past you has failed to achieve. If this December is like most, though, "future you" will be a lot like today you, with the exception of an extra 5 pounds and $1,000 in credit-card debt. What if you had resolve? Real resolve doesn't wait for the future you. Real resolve is, by definition, firm and decisive. So, what if you had real resolve? You wouldn't wait. In fact, you'd have already started. So, ask yourself the really tough question  why haven't you already started? Do you have real resolve, or are you using resolutions as yet another way to delay something difficult for one more month? Sorry, I'm getting a little carried away with the questions. This one's important, though. Whatever it is you have planned for your future self, the magical being who will emerge on January 1st, why can't you start it today? Sure, you may have to take a break for a week while you're out of town, and you may have a day of indulgence in Christmas goodies, but so what? Progress isn't all-or-none  start tomorrow, and, if nothing else, use December to learn the kinks in your plan, so that you can really hit the ground running next year. Even better, use December to be honest with yourself and face the reasons you're really putting those resolutions off.